The “99 Virginia Football Thoughts Before Kickoff” series passed 30 entries this week as TheSabre.com counts down to football season. UVA opens with Richmond on Saturday, Sept. 1 at 6 p.m. The season’s first kickoff for the Hoos comes at Scott Stadium. As this series rolls into the 33rd entry, I thought it would be fun to point out a few names that hopefully get a moment in the spotlight this season. Maybe its a special teams play. Maybe its a VirginiaSportsTV.com feature. Maybe its something else. Throughout the offseason months as fans, observers, and reporters break down the team, certain names inevitably draw the conversation. Bryce Perkins, the transfer quarterback, figures prominently into the Cavs’ chances this season. Defensive linemen get a lot of chatter since that position looks potentially thin from an experienced depth standpoint. Olamide Zaccheaus and Juan Thornhill seem set for their senior year. This article isn’t about those guys. I wanted to pull out a few names that it would be fun to see have a good moment at some point during the 2018 season. Think about players just now on the rise to the depth chart or late-career guys that have stuck it out during the coaching changeover. Here’s seven guys to root for this season. Tim Harris. 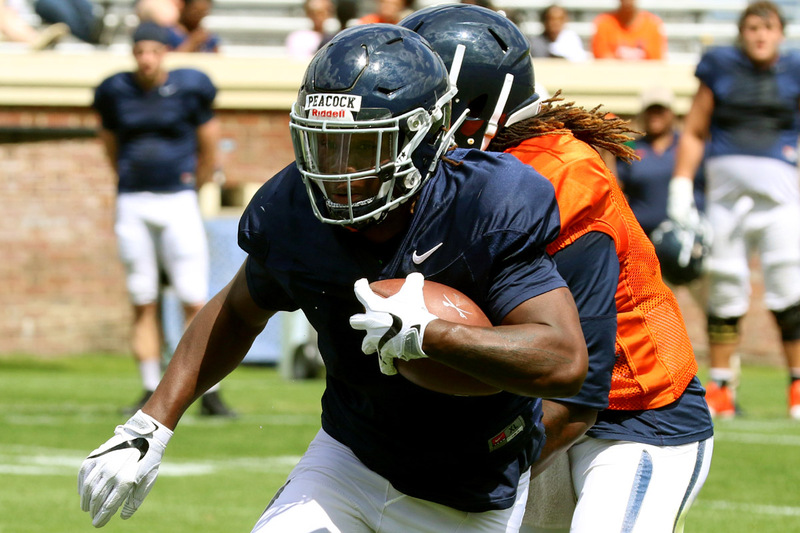 While he’s not an overshadowed name or someone that has not seen the field much in his career, Harris is trying to shake the injury bug during an unexpected sixth year with the Hoos. Harris started seven games as a true freshman way back in 2013 and has started many games since. Still, injuries started to steal playing time for him in recent years, especially in 2016 and 2017 when a shoulder injury and then a wrist injury limited him to three total games. That included getting hurt in last season’s opener. Much like friend Andre Levrone finally broke though with a healthy and productive season a year ago, UVA fans should hope for a successful swan song for Harris. Ben Hogg. Originally a walk-on from Brookville High, Hogg picked up a scholarship prior to the 2016 season. He played in nine games that season on special teams and as a receiver. Last fall, the Cavaliers opened the season with a completion to Hogg on the first offensive play of the William & Mary game. He started two of the first four games, but a practice injury prior to the Duke game ended his season. As a fifth-year senior trying to bounce back from injury, a moment in the spotlight would be cool for Hogg. C.J. Stalker. Ranked a four-star recruit by Rivals, Stalker came to Virginia late in the Mike London era when such highly ranked players had reason to look elsewhere. After enrolling in January and making an early impression, Stalker eventually slipped around the depth chart and made just one start in 2015. When the coaching change happened, Stalker had to start over like everyone else and ended up behind Micah Kiser and others at middle linebacker. He played in just four games in 2016. He carved out a bigger role last season when he played in nine games and made eight tackles. All in all, though, Stalker hasn’t seen too much action for the Hoos. Maybe he gets a chance for a good moment this season. Dominic Sheppard. The junior linebacker made his collegiate debut last season during the win at Boise State and eventually appeared in three games for UVA. As one of the first players to join the program from Gulliver Prep in Miami where former Hoo Earl Sims is the coach, it would be great to see Sheppard break through for some action this season. Virginia has established a little bit of a pipeline to Gulliver after all. More importantly, Sheppard joined the program ahead of London’s last season and has stuck it out through three college seasons with little PT to date. It’s easy to root for guys like that. Elliott Brown. One of 17 true freshman to play last season, Brown has sort of gotten lost in the offseason chatter. He played in 10 games last season after he made his debut against UConn. Along with Charles Snowden, he made some splash plays in 2017. He got a half sack with Snowden at Boise State, shared a tackle for loss with Snowden at UNC, and recovered Snowden’s blocked punt at Miami to set up a touchdown. He also partially blocked a punt against Pitt. At 6’5” and 225 pounds, Brown could make an even bigger impact somewhere this season. Nick Grant. After redshirting in 2016, Grant became a regular on special teams last season as he appeared in 12 games. He ended up with two tackles. During the spring, Grant started to see some more time on the defense where he could be in the mix at corner in some packages this season. Fans didn’t get to see his progress, however, because he had surgery prior to the final spring practice that was open to the public in order to heal fast enough to be back for the regular season. Grant picked off seven passes as a junior at Courtland High so maybe he makes one of those plays this season. Jamari Peacock. As one of three peas in a pod of freshman running backs with PK Kier and Lamont Atkins, he saw a lot of playing time last season on offense. In fact, he appeared in all 13 games with two starts. Still, his role was primarily as a blocking back and that doesn’t always get a lot of attention. Peacock figures to be a factor as a blocker again this season, but maybe he gets a carry or few too. Incredible job of reaching down into the roster and finding some possible diamonds in the rough. I’d add the oft-injured Malcolm Cook to that list.